A chronicle of the early years of Laura and Almanzo’s marriage, this short volume was produced directly from Laura’s unrevised draft and is consequently very different from the other books in the series. Rather than being divided into short chapters based around a particular event, it contains just four long chapters, one for each year. In addition, it wasn’t edit to be child-friendly – sad or upsetting events were not glossed over, and many details remain that Laura probably would have edited out had she readied this for publication before she died, such as details of her pregnancy and boring financial information. There is some overlap in the story, as this book begins with a slightly different retelling of Laura and Almanzo’s wedding than we got in the last book. The most noticeable difference was that when Almanzo (now known as Manly) asked Laura to marry him, she hesitated and explained that she did not want to be a farmer’s wife. But Manly made a deal with her: he would farm for 3 years, and if he wasn’t a success, he would give it up. This promise is revisited throughout the book, after each year of farming. 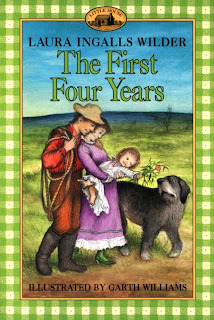 They agreed to a fourth year, and then at the end of the book Laura concedes that no matter how mixed their success may be, they are farmers at heart and thus always will be. There is much hardship along the way. Their crops failed year after year, Manly suffered a stroke during an illness that left him unable to do much physical labor, Laura struggled with household responsibilities and had a difficult pregnancy. The final year chronicled in the book culminated with enough trouble to dampen the most hearty pioneer spirit. They are still struggling with both of their claims, their crops, and now have added a herd of sheep (and a boy to help tend them) to their responsibilities. Then Laura has another baby who dies three weeks later. Soon afterward, their house burns down. Had Laura revised the manuscript before her death, surely it would have fit in more with the rest of the series. She would have eliminated the details about the baby who died and probably all the details surrounding her pregnancy with Rose. She certainly would have left out the unnerving scene where their neighbors, the Boasts, beg them for Rose because they cannot have children of their own. We would have learned of the crop failures, as we learned of setbacks during her time with Ma and Pa, but the failures would have been surrounded by happy times, details of projects around the house, family get-togethers and other fun occasions. The First Four Years was a rather startling glimpse of reality, and makes me wonder just how much was left out of the earlier books. Though I am interested in the sorts of hardships endured by pioneer families, the tone of this book is completely different from the rest of the series and the hopeful note on which it ends is rather frail. I’m glad to have re-read it as an adult, but I want to return to those happy times with Ma and Pa in the dugout on Plum Creek.